It is an honor to be a guest blogger on this site, both because it belongs to my father and is frequented by people with such a resilient and optimistic spirit! Paul and I share much in life, including a wonder and appreciation for what is beautiful in the world–the depth of colour in a flower, the smell of salt air fresh off the ocean or the way a smile from a stranger touches your heart. We also share a deep need to communicate with the world, especially through the written word. I have loved watching this Being Inspiring ‘word community’ grow around the theme of inspiration. While we share much, our paths have been quite different ones. 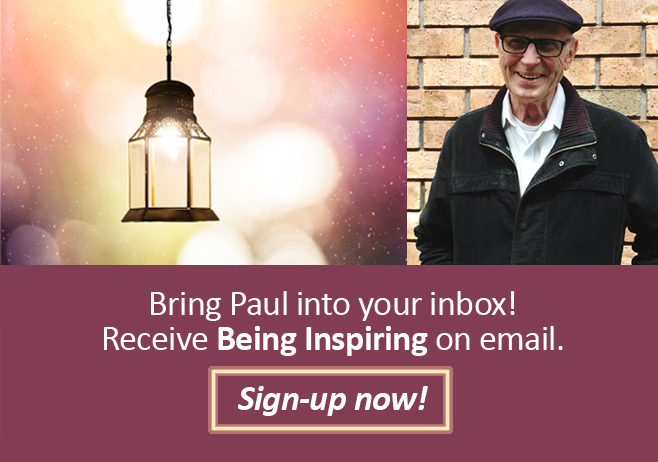 Paul’s life has focused on the human spirit where mine on the conservation movement. So, after decades devoted to wildlife conservation in particular, I am proud and excited to be writing my first book: Birdsong After the Storm. It will be published in mid-late 2016, by Ashgate Publishing. I believe that a storm is coming–one we have not experienced before. The political upheaval caused by climate change will impact us all. I feel like I am standing on the edge of a field watching massive clouds rolling in across the horizon. I am concerned and compelled to write. In my years of working in conservation I have met many inspiring and wonderful people doing good work in their local area, wherever that might be. Some fight to protect precious waterbirds and wetlands from bulldozers and mining companies. Some rescue orangutans from forest fires lit by multinational companies. Others step in the footsteps of giants–the elephants that walk the plains and forests of Africa. Their efforts are inspiring, their results are real. But their voices are not heard in the big picture international discussions between our governments–discussions that touch all of our lives. Birdsong After the Storm speaks of the urgent need for governments to invite civil society to the international governance table, to respect and listen, and secure what is precious so that there will be birdsong after the storm. If you would like to know more about the book as it unfolds, please join me at wildpolitics.co I would also be honored if you chose to become part of my writing journey through my crowdfunding campaign. Congratulations, Margi/Margaret, for writing and publishing your passion about the health of the natural world! Good to see your smile, too. Pamela and I first saw it and you over thirty years ago, and it’s very good to reconnect. Wishing you all the best success! hello John – thank you for your comment and the reconnect. I remember our meeting very well indeed. Much has changed and some things – like the smiles of friends – remain the same! hello Maria – thank you also for your comment and the reconnect. I am pleased to be following in your footsteps as an Antipodean author!